Mid July after a wonderful trip. 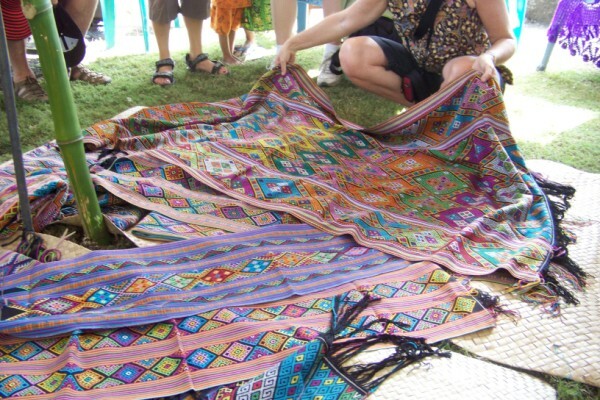 This is the story of West Timor and its textiles. I have just returned from a 16 day fabulous textile tour organised through Active Travel with Ruth Hadlow as the textile expert. There were 10 in the group representing most states in Australia. We visited various villages, cooperatives, organisations and markets. In some areas one technique was focussed on while in others several were combined. 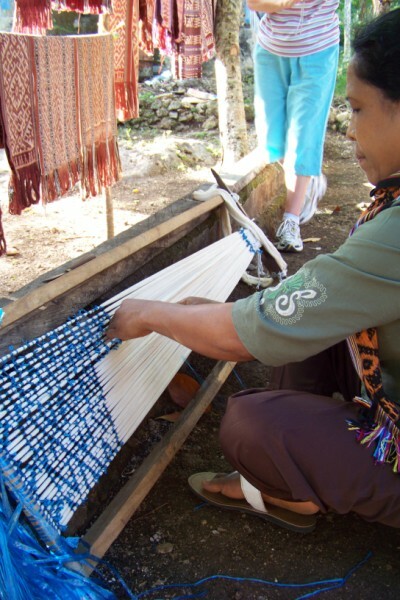 West Timor textiles are a visual feast! 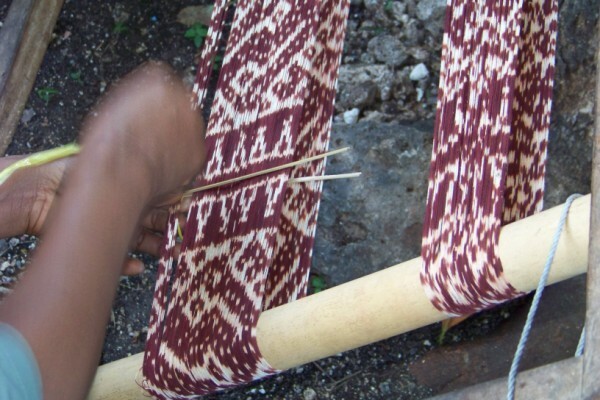 There are 3 main techniques practiced: warp ikat, buna (a discontinuous supplementary weft) and sotis (supplementary warp patterning). In addition there is some naisa or tapestry weave though this is not as extensively done as the others. Both chemical and natural dyes are used. 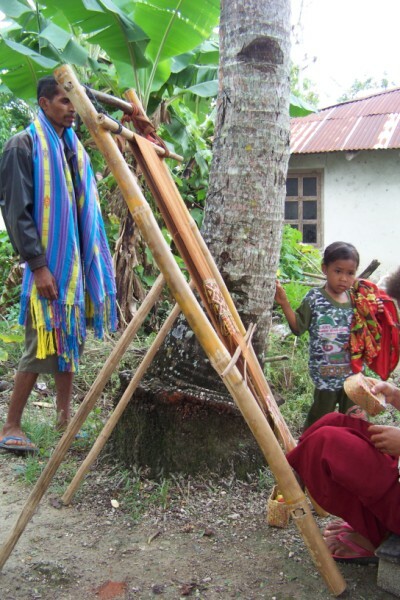 We saw demonstrations of the spinning, natural dyeing and weaving techniques. Cotton was the only fibre that we saw being used either hand spun or commercially spun. In addition to the weaving, we visited museums and commercial establishments including a wonderful visit with Pak Alfred Makh, an antique dealer, saw palm sugar being processed with beautiful baskets being used to collect the syrup, experienced music being played on interesting instruments and dance performances. We ate the native cuisine. We saw the interesting landscape and experienced the difficult roads. But what was really one of the great highlights was the opportunity to experience the culture. 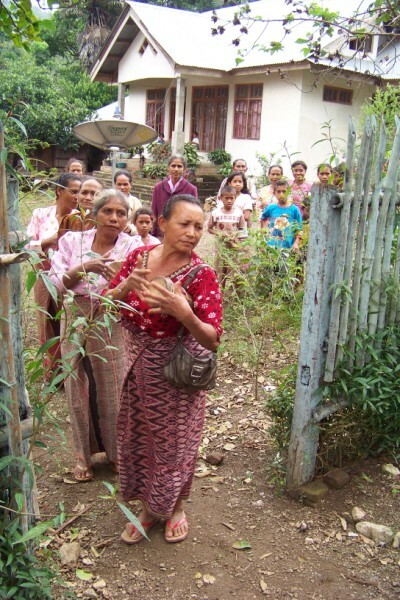 At each village or organisation a formal welcome was performed and again when we left. Many of these were extremely moving. The following are some of the trip’s highlights. 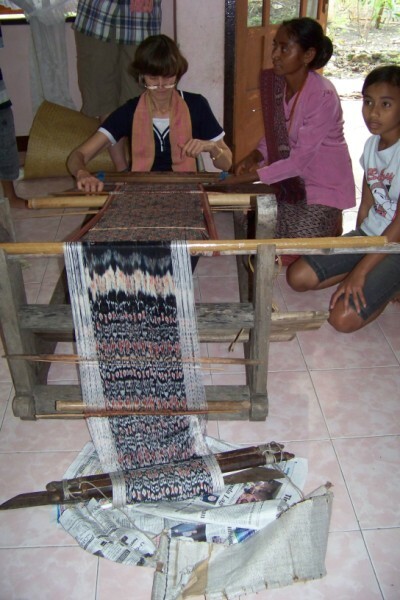 A weaver in Aramasi tieing a warp for ikat. Note the examples in the background. Each stage of the process was explained: preparing the yarn, dyeing and weaving. The warp has been dyed in morinda. This dye is extracted from the bark of a tree. In some areas rather than chopping down the tree, sections of root are exposed and the bark removed from there and then covered back up with dirt, hence not killing the tree. 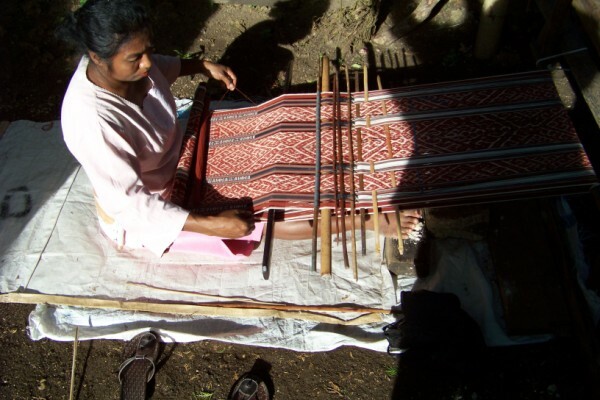 A back strap loom is used primarily for all weaving apart from the tapestry technique. All weavings as a result are circular with an unwoven warp gap when the weaving is finished. This is later cut to produce the fringe at either end of the textile. Sometimes the cloth is sold uncut to identifiy it as a new cloth. 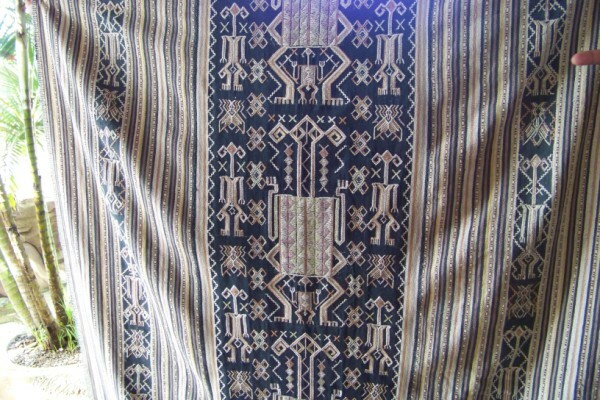 Buna cloth is made of of a background plain weave fabric with a discintinuous supplementary weft. 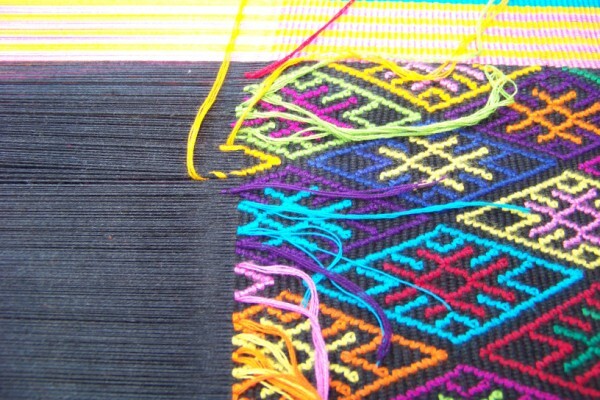 Each weft colour requires a separate thread. The coloured thread is wrapped around a group of warp threads, thus producing very clean imagery. What a splendid visual feast. How is one meant to choose between them? Did I mention that the shopping was great! 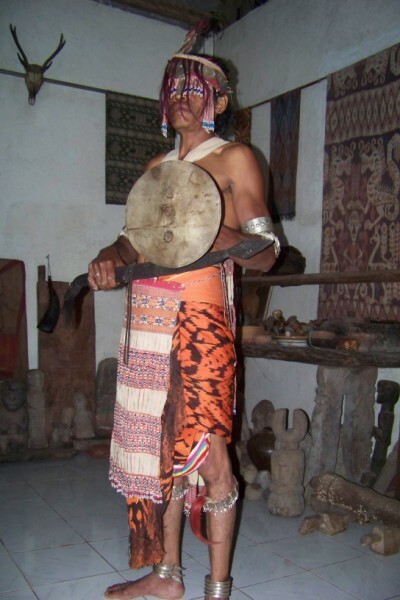 This is a costume from a head hunting culture and was worn by a Meo or hero after the return from a fight. Not many of these have survived and this is possibly the only full costume. It is in the collection of Pak Alfred Makh. The Prodestant Church banned the costume. In 1965 Alfred could remember a truckload of sacred objects including Meo outfits being burnt. Our model is a descendant of a Meo. It is an inherited title, still recognised today but originally a young man could have become one if he exhibited the right qualities. 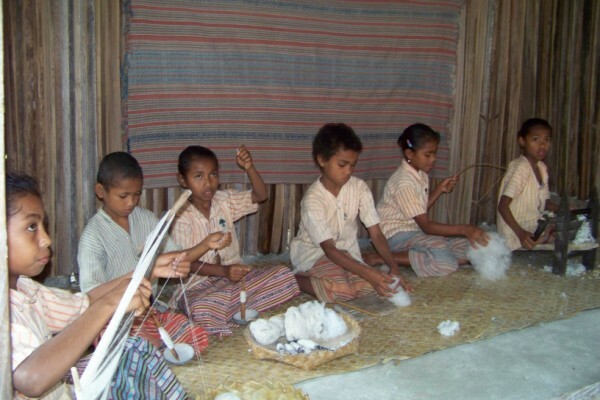 Weavers buy their cotton yarn in the market. We did also. It comes in only one thickness but a variety of colours. We were given several demonstrations of the preparation and spinning of cotton. In this village children showed us but usually it was done by women. The process includes the removal of the cotton seed using a gin, fluffing the yarn, aligning in small quantities, spinning on a drop spindle and then winding it off in skeins. We did have a chance later when we visited a cooperative to try our hand at using a drop spindle with varing degrees of success. We visited a foundation, Yayasan Tefean Pah which is run by Ibu Yovita Meta. She coordinates 12 weaving cooperatives and is training weavers to relearn natural dyeing processes and weaving techniques. The foundation also collects work in a museum and through a gallery sells the work produced by the cooperatives. I got to have a go at weaving on the back strap loom. In fact I had a wonderful time with this group of weavers. It is interesting to note that 2 warps can use the same frame. At Saingup village we participated in a dyeing worksop. But first the welcome. All the ladies were dressed in very beautiful skirts. Men are not encouraged and play no role in the dyeing of yarn! In the foreground there is a selection of some of the raw materials that we used for the workshop. We saw dyeing with morinda (red brown), indigo, mud (black), tumeric and mango (yellow) and a selection of leaves (green). I will experiment more with their recipes and processes at a later date. We were invited to participate in the indigo and mud dye processes. Yes, I did end up with blue hands for a number of days and I also played with the mud, working it into the fabric after it had been in a tannin bath. It was a fun experience. This is the loom for weaving naisa or a tapestry fabric. The man in the background was wearing a most beautiful fabric. Naisa or tapestry weave is also done on a circular warp. This image shows the final “fringe” being woven. The weaving starts with a fringe, then a tapestry panel, a plain weave section and then the reverse at the other end. In the background the plain weave fabric can be seen. 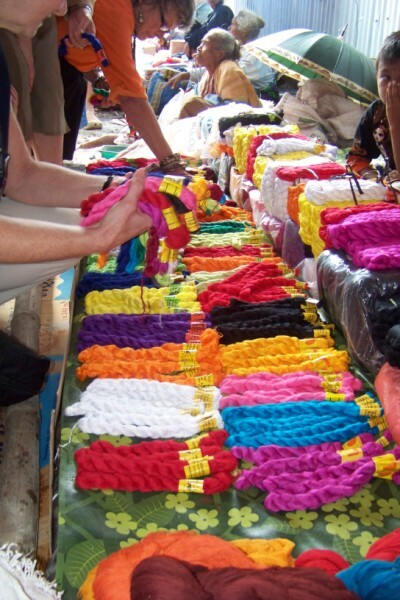 Beads are often strung onto the warp to decorate the fringe. This is a wonderful example of sotis, the supplementary warp pattern technique. It has been combined with warp stripes to achieve a very complex cloth. Natural dyes have been used. Often a cloth may combine several techniques. We saw many cloths combining ikat, buna and sotis. 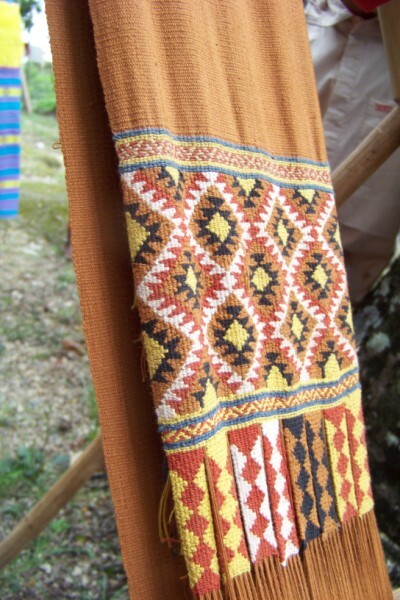 Often the buna and ikat are woven in stripes or bands. This example shows wonderful integration of the two techniques. This cloth is unusual. 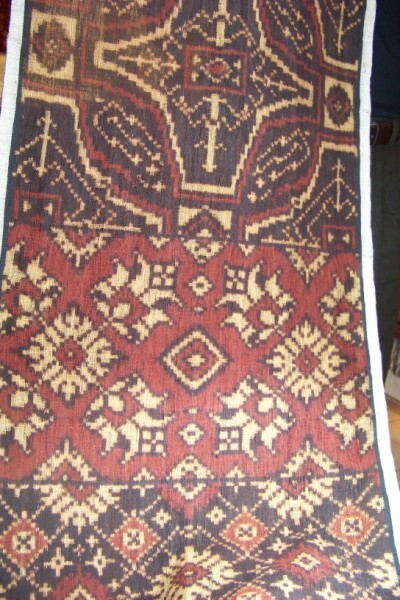 Often buna, sotis and ikat are combined in any combination the one cloth. We were privaledged to visit Ruth’s home and see her collection. 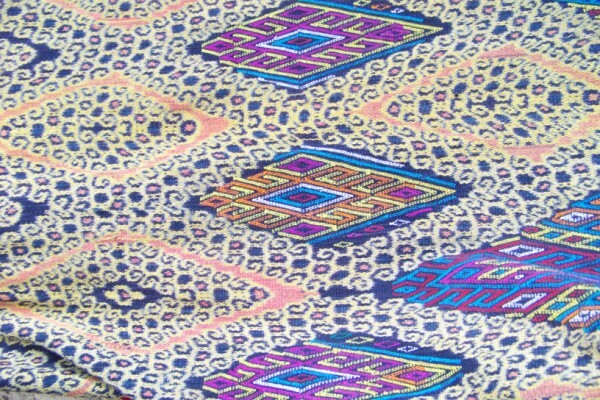 This cloth combines sotis, buna and tapestry. Tapestry is usually seen with plain weave. 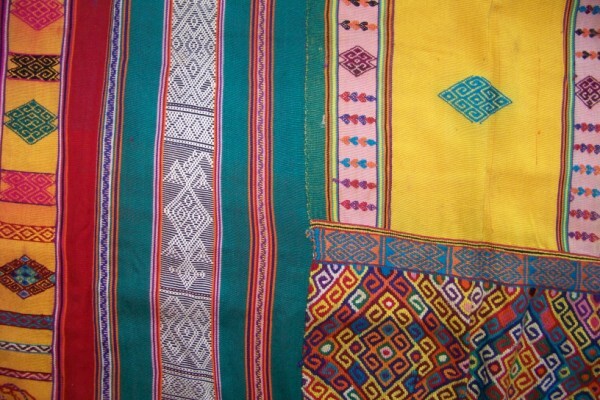 Cloth for “skirts” whether for men or women are usually woven in 3 panels. 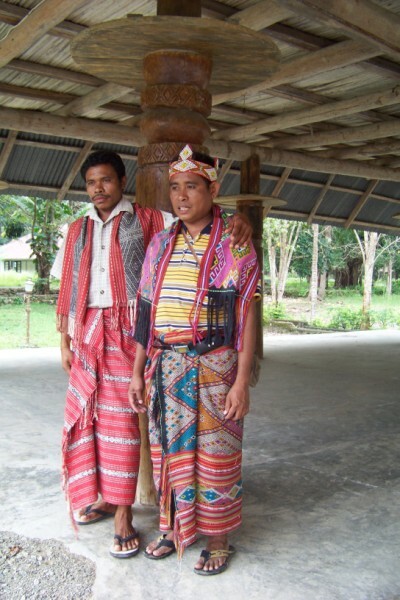 Oni, our interpreter on the right is wearing a fabric with a central panel of buna with a sripped fabric either side. To our western eye, often the panels don’t belong. His scarf is also buna while his “crown” is beaded. On the left is our driver’s assistant whose name we pronounced as Tunnel. He has a sotis skirt and scarf. After 12 days in West Timor, we finished the trip with time in Bali. What a contrast! There were so many tourists! Highlights included a visit with Threads of Life , a visit to a market and a walk in a rice paddy (away from the tourists). Threads of Life, www.threadsoflife.com is an organisation that work across 10 islands in Indonesia, commissioning and buying textiles as well as running a series of activities designed at encouraging weavers to ensure techniques do not die out. It was a wonderful way to reinforce many aspects that we had explored in our investigation in West Timor. 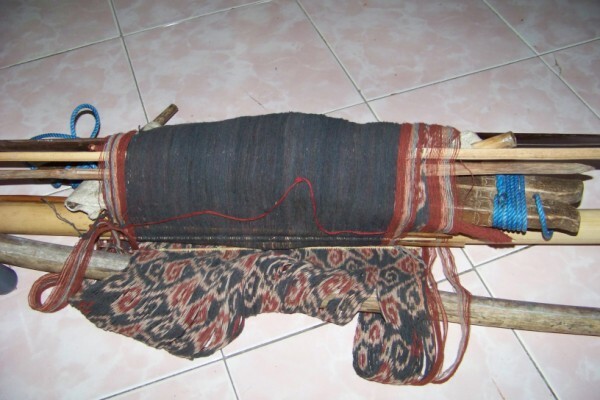 Double ikats are produced by a small number of weavers on Bali. This example was shown in Threads of Life. It is natural dyed cotton in a very complex pattern. The skill that is required to bind both the warp and weft so that the patterns coincide are enormous. It was a wonderful trip. These images show only one aspect with the focus on the textiles we saw and don’t do justice to the whole. You are currently browsing the Kay Faulkner's Blog blog archives for July, 2010.